You are currently browsing the category archive for the ‘R’ category. Sukūriau naują blogą: http://myliuduomenis.lt. Įrašai daromi su Rstudio naudojant knitr. Puslapio kodą galima rasti čia. Į kažką panašaus galbūt numigruosiu ir šitą blogą. Bit of a major rewrite. Added formula interface, convergence testing and support for different optimisation algorithms. Documentation needs to be updated, but all the examples and demo work. Downloads in the usual place. Added empirical example. Run demo("okun","midasr") to see. Also changed function hAh.test. Now only restricted model must be supplied, unrestricted is calculated automatically. Downloads in the usual place. I’ve decided to release a new version of midasr package. In this package the support is added for numerical gradient, exogenous variables and more complicated lag structure. The downloads are in the usual place. I’ve created my first R package midasr. Phew, documentation took as much time as actual coding. On the other hand the code was provided by my collaborator Virmantas Kvedaras. My task was to clean up the code and prepare R package. The package is for testing MIDAS regressions. This is a first release, so the functionality is still very basic. So I’m getting my daily fix of r-bloggers.com and I encounter this post. 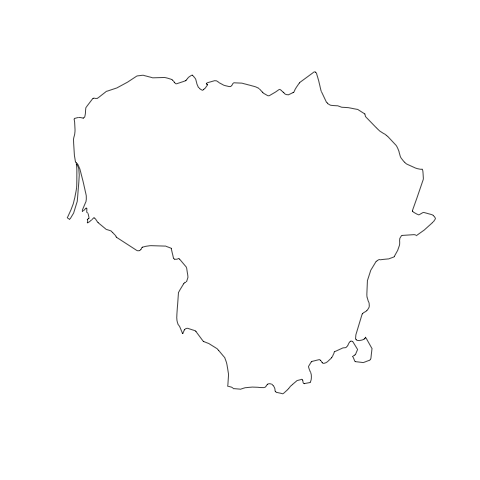 Hey, I figure, if polish can draw his country flag using R, why can’t lithuanian do it? 🙂 It should be easy, as cut and paste, right? It turned out not so easy in the end, but not that hard either. Here is the final result. The R code with the description of the process is below. After searching a bit, I did not find the R package with the updated map, but I found out how to get more recent map into R. First you need to download the following file from this site. The simplified map from this site is in R package maptools, but it seems the full version is not available as an R package. As you see in the end we get the data.frame with longitude and lattitudes and additional info. The relevant additional info in our case is in pieces column. Lithuania consists of 2 separate pieces: the mainland and Curonian spit. Since only part of Curonian spit belongs to Lithuania, it is not connected to Lithuanian mainland. So in the map it looks like an island, when in fact it is not. Now we have the shape, we need only to fill in the colors. To do that we need to divide the 2 polygons into 3 pieces with equal heights. I borrowed some code from Bogumił Kamiński. The function just adds two points to the array of points. It checks whether the polygon is cuttable, i.e. the horizontal line goes through the middle. It also assumes, that the line cuts the the polygon into 3 pieces, if we imagine the polygon as the line with the start and an end, which basically what polygon is in R. It is easy to add the code for the case of 2 pieces, but this case is rare, and I was lazy, so there you go:). ##Colors of Lithuanian flag, from top to bottom. ##Gzr stands for geltona, zalia, raudona: yellow, green, red in lithuanian. Using this code it is more or less easy to replicate this exercise for other countries which have flags with where colours are horizontal and there are no additional structures. Flags with vertical colours should be easy too. But flags with more structure as flag of Finland, or United Kingdom would be naturally harder. read on, I dare you! So for a start, you must have Emacs installed. For Windows I recommend downloading Vincent Goulet’s prepared Emacs distribution. It comes with several useful packages preinstalled, such as ESS. For Ubuntu, your best bet would be to install emacs-snapshot, so you get nice looking Emacs. Then you will need to install ESS. For serious R programming, I think ESS is a must. I do not go into details, but is much more convenient than standard R window. Then if you are finished, just press f12, and Emacs will open you a new window with shiny HTML code. Copy this code to your blog, and that is it. Sweave function from R on your text. The resulting file is exported to html by org-mode. By pressing f12 you invoke function htmlize-blog-entry, which exports to html, without invoking R. Since we use org-mode export, you can syntax highlight not only R code, but other code, which has support in Emacs. This means C, emacs-lisp, latex and others. So here it is. If something did not work, try asking here, maybe I can help. I do not promise anything, I am no Emacs expert. since then I need to pass different nm for each list element. You can even do some interesting stuff with parallelization, since foreach supports it. So if your computer has processor with several cores you can use both for intensive calculations. BTW if anyone knows easy way of highlighting R code in wordpress, let me know.